American Waterworks supports 2017 Eagles Cancer Telethon in Rochester, MN. American Waterworks was proud to be apart of the 63rd Annual Eagles Cancer Telethon this past weekend at the Mayo Civic Center in Rochester, MN. The 2017 telethon raised $972,183 during the 20 hour event, which began at 8 p.m. Saturday and ended at 4 p.m. Sunday. The 2017 donations will benefit several local cancer research facilities including the Mayo Clinic, The Hormel Institute and University of Minnesota for cancer research. American Waterworks was blessed with the opportunity to create awarenes about the presence of Radon, a colorless and ordorless radioactive gas, within our homes and the toxic affects of breathing in these radioactive particles. With Radon being the number one cause of lung cancer in non-smokers, American Waterworks felt that this was the perfect opportunity to give back to those who have been affected by cancer by offering free radon self test kits for visitors to take and test their homes at their convenience. 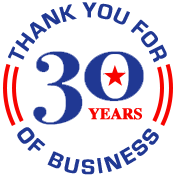 American Waterworks was also able to give back in an even bigger way because of you, our loyal customers. In November 2016, American Waterworks ran a Lung Cancer Awareness Month promotion offering half price radon testing for homeowners in Minnesota. The radon campaign was a success and with your help, American Waterworks was able to make a $2,000 donation to the Eagles Cancer Telethon yesterday.